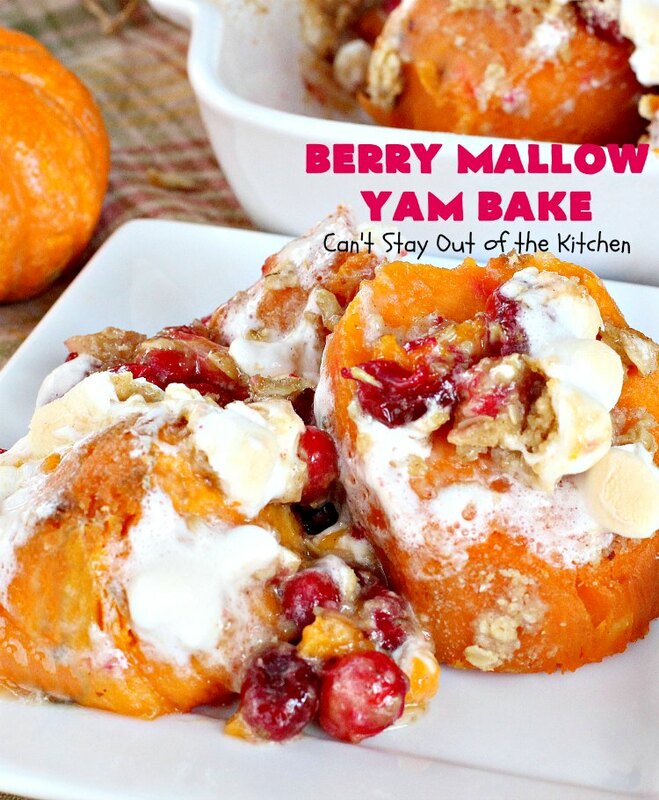 Hands down, Berry Mallow Yam Bake is my husband’s favorite sweet potato recipe. It is so sweet he eats it like a dessert! It is one of those deals where I better make it at least once or twice a year during the holidays, or I’ll hear about it from him! This casserole is so succulent with the flavors of sweet potatoes, cranberries, a delicious streusal topping and then covered with marshmallows permeating every bite that the smells wafting through your house will excite your taste buds like crazy. 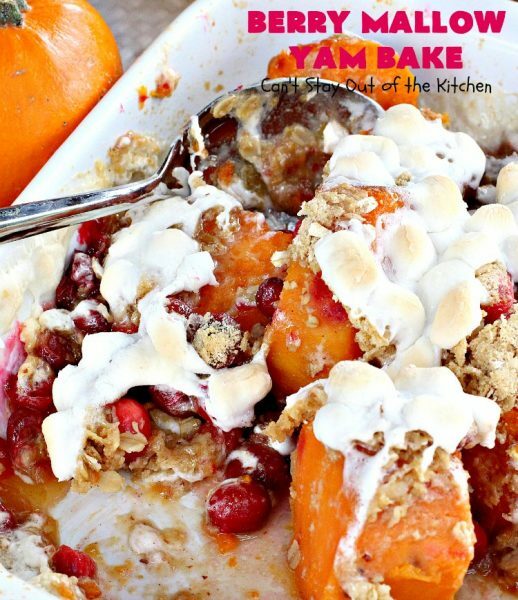 We love Sweet Potato Casseroles at our house and I have a ton of recipes for them. Some include Sweet Potatoes Parmesan, Sweet Potato Casserole, and a Loaded Bacon and Cheese Sweet Potato Bake. I have one stuffed with bacon and cheese, and one stuffed Tex-Mex style. I also have several recipes for sweet potato fries, soup, biscuits, cornbread and even one in enchiladas! 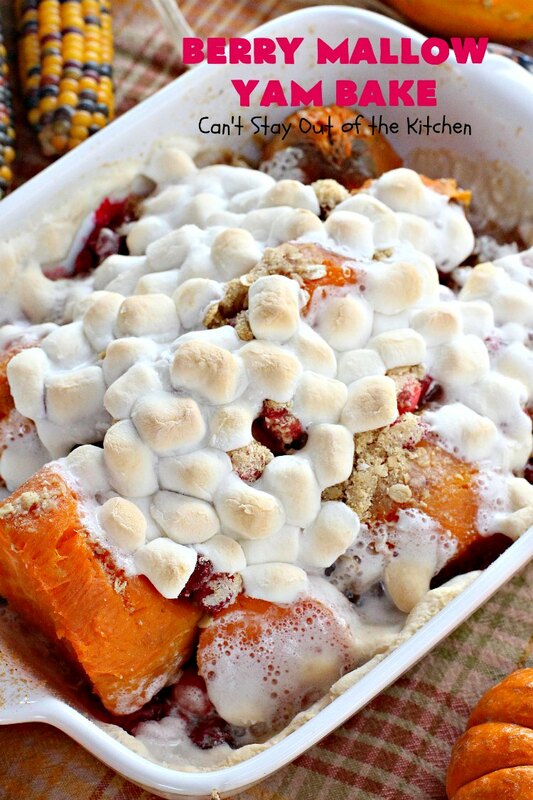 Yes, I love sweet potatoes. Berry Mallow Yam Bake is a delight to all who partake! It is simply amazing. I can’t say enough about the taste of this dish. It is such a comforting casserole for Thanksgiving or Christmas or other holiday get-togethers. We love this much-requested side dish and think it is the perfect accompaniment for either turkey or ham. I received this recipe back in 1978 during the Thanksgiving holidays from my former mother-in-law, Beth. But I believe this recipe originated from Kraft and they put it on the back of their miniature marshmallow packages for quite some time. It is a fairly simple recipe to follow but BIG on taste. Try it sometime–your family with love it. I make this gluten free by using gluten free flour when I make it. 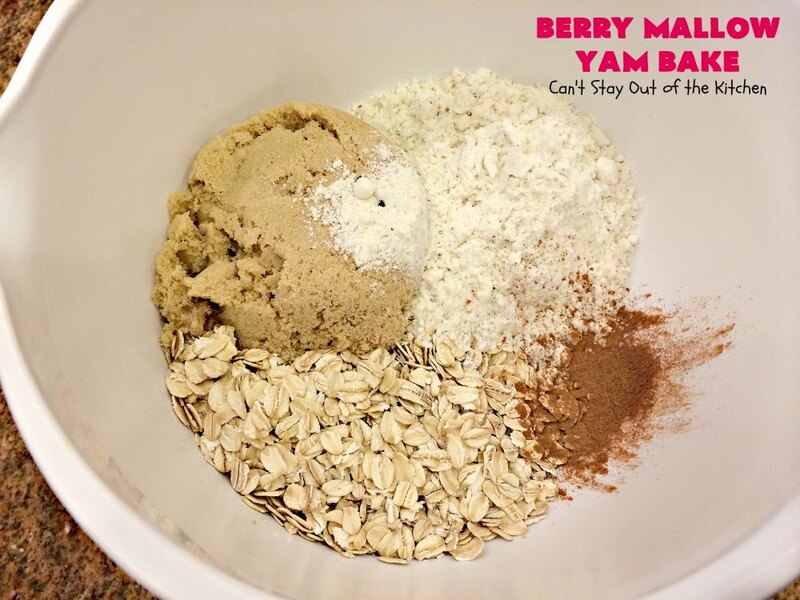 To make this vegan simply exchange the butter for coconut oil. You can also use canned yams if you want to make it even easier. Our family has loved this recipe for decades and every time we bring it to a Christmas party it gets wolfed down in no time! 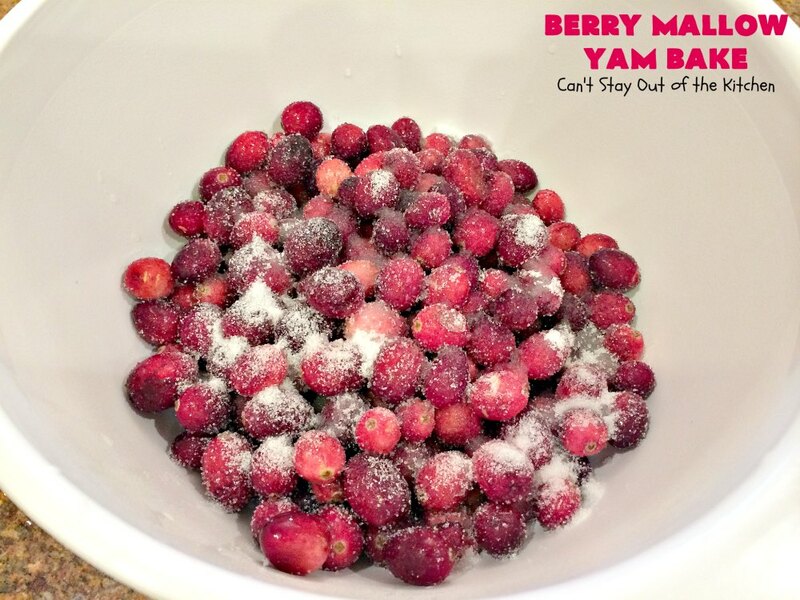 When I first posted this recipe in June 2012, I had only been blogging for a week. My photography skills were very poor and my camera even worse. I recently remade this scrumptious dish for another Christmas party, circa 2014, and decided to take some fresh pictures which more ably depict the beauty of this amazing side dish. This lovely holiday casserole is well worth the effort. 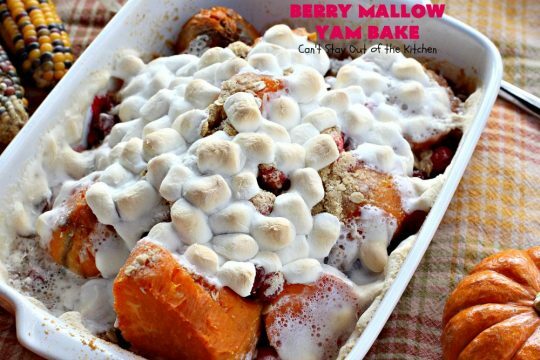 Berry Mallow Yam Bake is so scrumptious, it’s a wonderful comfort food. Berry Mallow Yam Bake has always been my husband’s favorite holiday casserole! 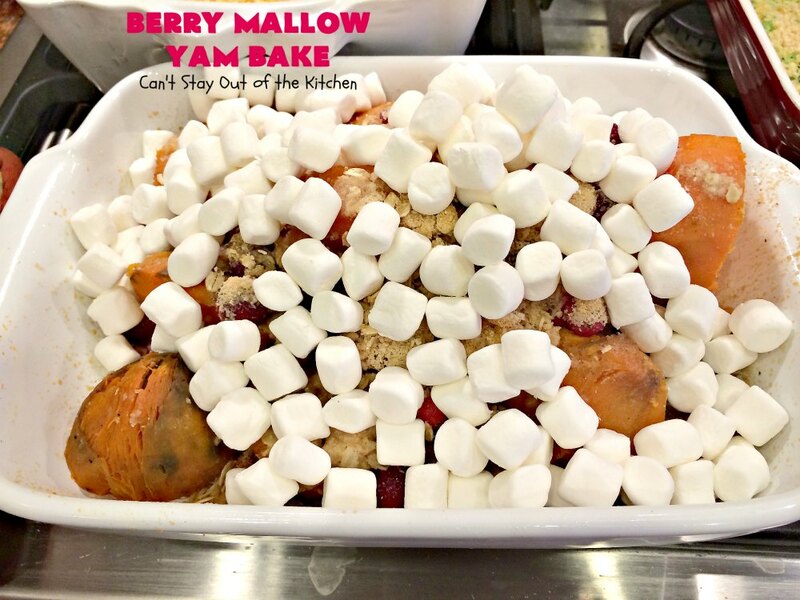 Doesn’t Berry Mallow Yam Bake look amazing? 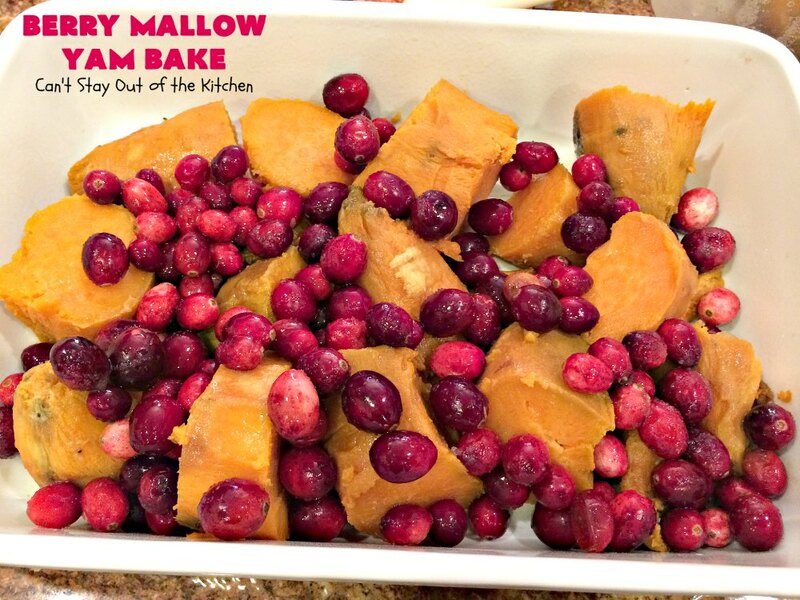 This is a great casserole to include in your holiday baking. Everyone loves it! I used these ingredients. I cooked off 6 large sweet potatoes. 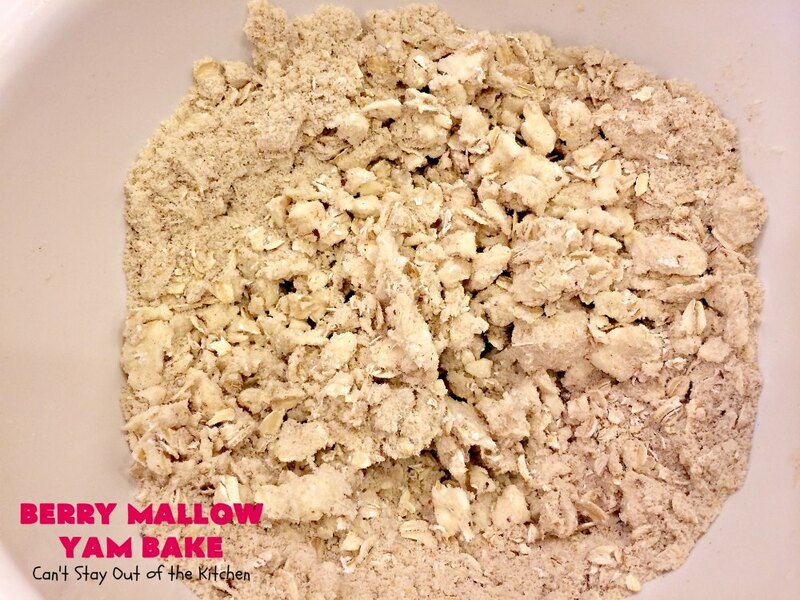 I used a gluten free baking mix instead of regular wheat flour. Wash cranberries. Add granulated sugar to the cranberries. Stir to combine. 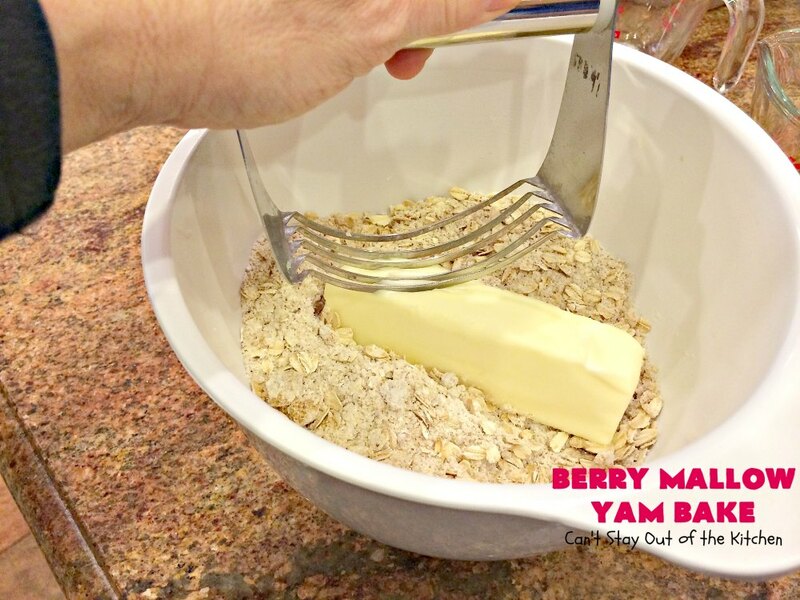 Make streusel: Combine brown sugar, cinnamon, Pamela’s baking and pancake mix and oatmeal. Stir to combine. Cut butter into streusel mixture until coarse crumbs form. Spray a 9×13″ glass baking dish with cooking spray. 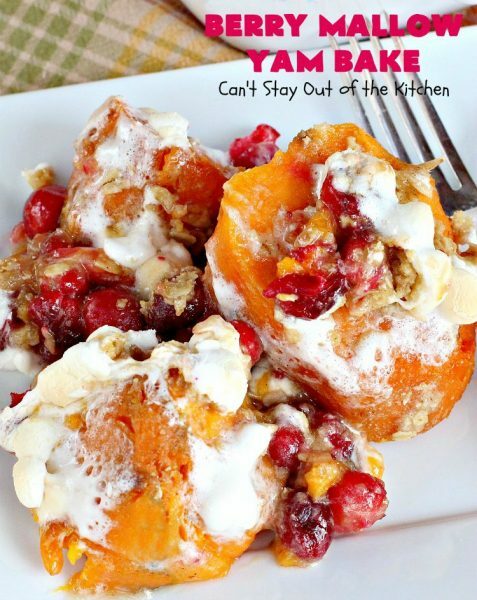 Cut baked sweet potatoes up into 2-3 inch chunks and place in dish. Sprinkle sugared cranberries over top. Sprinkle streusel over top of cranberries. Bake at 350, covered with foil, for about 45 minutes to 1 hour. Bake an additional 5-10 minutes or until marshmallows get lightly browned. Be careful to watch your time on this as the marshmallows will scorch easily. We love serving this casserole for holidays. I make it gluten free so everyone in our family can enjoy it. But if nobody in your family has gluten intolerance you can use regular flour. 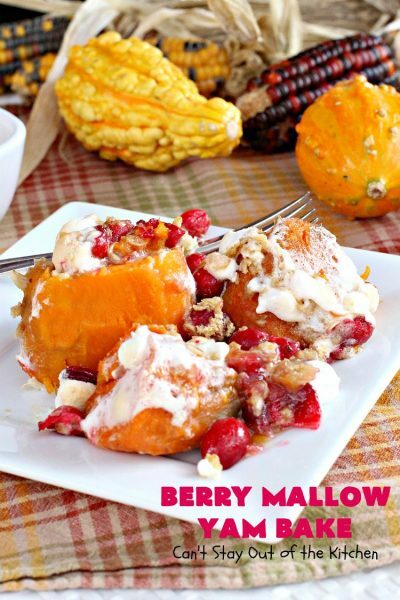 Scoop out a serving and enjoy! John likes eating this as dessert all week! 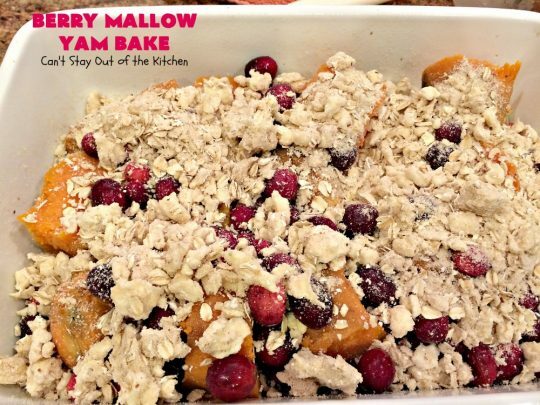 Sweet potatoes, cranberries, marshmallows, and a luscious streusal topping with oatmeal, brown sugar, butter, cinnamon and flour are what makes up this amazing casserole. This side dish is almost decadent! This lovely side dish is spectacular for holiday dinners. It goes great with turkey or ham. Sweet potatoes are paired with sweetened cranberries and a lovely streusel topping. Then they're topped with marshmallows making this a wonderful treat. In a small bowl, combine flour, brown sugar, oatmeal and cinnamon. Cut in butter as for pastry; blend until crumbly. Sprinkle cranberries with regular sugar. Spray a 9x13” baking pan with cooking spray. Layer the cooked sweet potatoes, the cranberry mixture and crumb mixture. Bake at 350° for 45-60 minutes or until heated through. 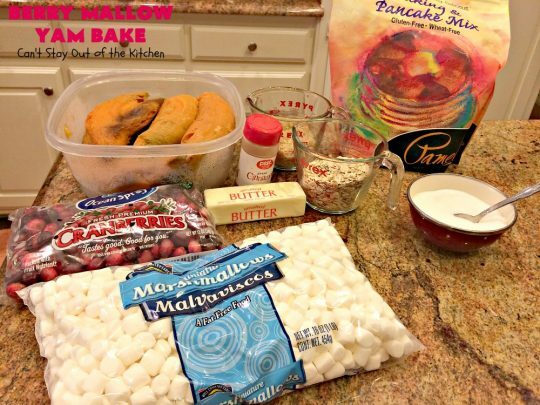 Sprinkle marshmallows over top of the casserole and return to oven just until marshmallows are puffed and lightly browned. NOTE: Preparation time does not include time required to bake sweet potatoes (approximately 1 1/2 additional hours). This lovely side dish is spectacular for holiday dinners. It goes great with turkey or ham. 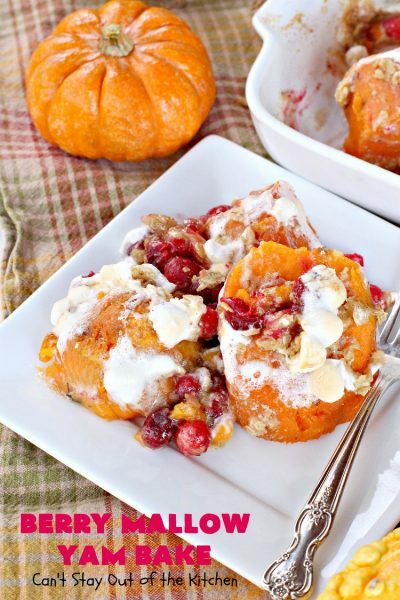 Sweet potatoes are paired with sweetened cranberries and a lovely streusel topping. Then they’re topped with marshmallows making this a wonderful treat. Spray a 9×13” baking pan with cooking spray. 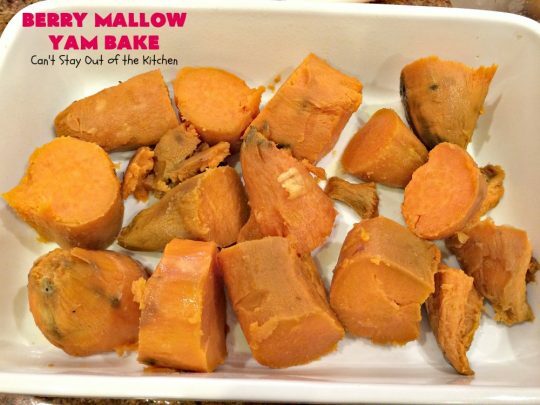 Preparation time does not include time required to bake sweet potatoes (approximately one additional hour). This is a terrific sweet potato or yam casserole. Either veggie will work fine. My husband would tell you this fantastic side dish is to die for! While I won’t go quite that far, it is one of the best sweet potato dishes I’ve ever served. There are lots of tart cranberries mix with the sweetness of the sweet potatoes, marshmallows and streusel. 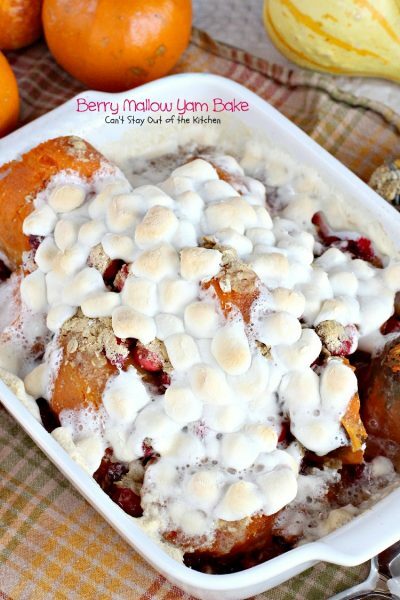 Berry Mallow Yam Bake is absolutely wonderful! It is amazing! You ought to try it sometime.